while my posting has been nonexistent the last few weeks don't feel i have forgotten about you! my family has a lot going on right now, a bun in the oven, a house on the market... which means a few things have fallen on the back burner for the time being, and one of those is blogging. i love doing this but i just have to focus on my family for a little bit. i'll try to post when time allows, please don't give up on me. moving on, i have a product to recommend that i have been loving! i ran out of my current concealer and i decided to splurge on a new MAC one. 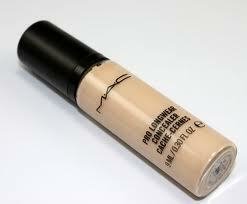 while at the counter i was introduced to a new product, the MAC Pro Longwear Concealer. i typically prefer a stick or cream concealer, not a liquid, but this liquid actually provides MEDIUM to FULL coverage. wow. that isn't easy to find in a liquid concealer. the coverage is smooth, the finish is matte, lasts up to 15 hours and looks fresh all day. my favorite feature is that it doesn't wipe off. while i typically have dark circles under my eyes, they seem to get exponentially worse when i am pregnant and i need the maximum amount of coverage to keep me looking fresh and bright eyed. this concealer has been the perfect solution and at its price point ($16) it is not too much of a stretch from your typical drug store concealer. my only complaint would be that the pump expresses a little too much product, and i hate wasting this liquid gold. in the realm of grail or fail, this concealer ranks on my GRAIL. thanks again for reading and please don't stop checking in. This post is perfect because I have been on the hunt for a good concealer! Yay! Thanks for sharing this, I just ran out of concealer and this looks perfect for me as well! if its a pro product can anyone by it? I saw this on Youtube the other day and totally thought of you! I love a good concealer. Not only do I have dark circles, but I have very dark eyelids. Without concealer, I literally look like a raccoon. It's not pretty. Mary Kay concealer is the only one that has ever worked for me, but I would definitely be interested in trying this one out.